I consider myself a very lucky twin mum – there was some bad luck along the way to being so lucky but I guess that’s the way it was meant to be. I had fallen pregnant naturally on honeymoon in November 2012 but miscarried and then after some difficult times in 2013 we found we had a fertility issue. I panicked that it would never happen. We tried a few other things first but after 6 months we were told IVF ICSI was the way to go so I very very reluctantly started that in May 2014. I was lucky to have good eggs and a good number too and the night before embryo transfer day, we discussed how many embryos we would want put in. I hoped they would recommend two and that if we were really lucky we could possibly then get twins. They said the chances of getting a baby was around 30% and twins was only about 5%. 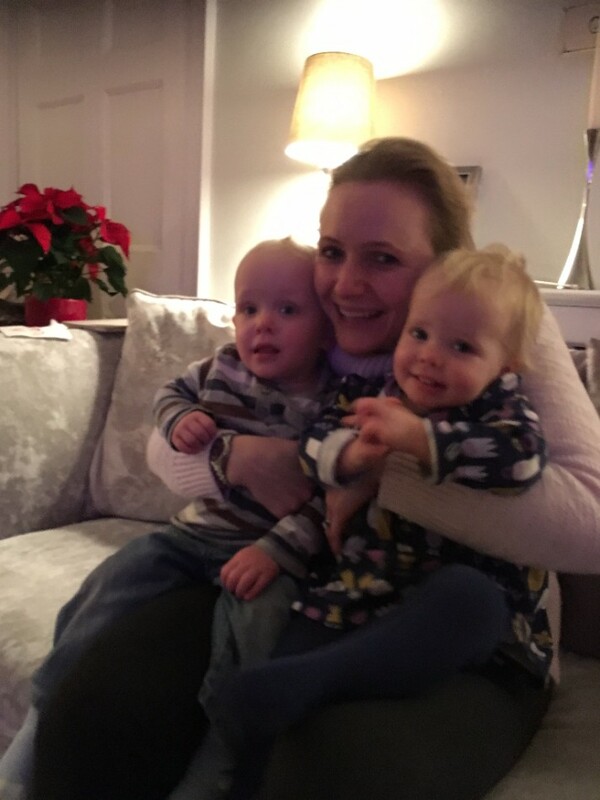 We decided that although the first year of twins would probably be very tough, for us in our situation and with my husband quite some years older than me (sorry Graham!) that to get two children in one go would be ideal. I really didn’t want more treatment either so I literally went on a mission to have twins. That’s what I was aiming for and had in mind all along. I had a pretty good pregnancy- yes I was tired, yes I was heavy, yes I had horrific acid half the night for months and months but apart from that nothing of note. I exercised quite actively throughout which helped I’m sure. My due date was 10 February and I decided that I would not go far from home from the 1st December in case they came early. I got everything ready in October & November. I was only working part time and virtually always at home in December and then left work just before Christmas at about 32 weeks. Christmas came and went, New Year came and went. I had fortnightly check ups and growth scans during January. It was my birthday on January 24 and I crossed my legs very hard that day because I did think it would be pretty ridiculous to have three birthdays on the same day! My consultant wanted to induce me at 37 weeks but I pushed them to 38+1 upon agreement that I would go in for heartbeat monitoring every few days for the last week or so and a couple of membrane sweeps to help things along. Nothing happened naturally and I was very pleased to have got so far along. Induction day arrived, I went in on the Wednesday morning and got checked and scanned. I knew I was having a boy and a girl and for the first six months of the pregnancy the girl was the presenting twin but in the later stages of pregnancy the boy pushed in front. I liked the sound of him already although I kept insisting that it should be “ladies first” and that she needed to retake her rightful place but it seemed it was not to be because they scanned me that induction morning and confirmed yet again they were both head down and the boy was the presenting twin. It was apparently not the time for girl power! I responded so well to the induction that I actually hyper- stimulated and was having crazy contractions very quickly and very fast. They said to take paracetamol (like that helped!) and then a very nice woman came round and helped me put on a tens machine. Not really sure if that helped much either – perhaps a bit. Lunchtime came and went- I had sent Graham to work for the afternoon under strict instructions to get back at the end of the day as quick as possible – this was in order to maximise his paternity leave. The afternoon is a bit of a blur and I think they removed the pessary to then slow me down but basically it was contractions and waiting. At 6 PM they told me I would be moved to the labour ward and Graham should’ve got back by then but he was running late (typical!!). By the time I’d managed to get all my gear while in labour (and there was an awful lot of it!) across the other side of the hospital and just about getting into my room he arrived right that moment and we settled in for the night. Soon, I had some gas and air and suddenly I projectile vomitted literally about 15ft across the room onto my beautiful brand-new Storksak leather changing bag. I love that bag – Graham just laughed! I wanted to shower and I wanted to eat. They told me I could wash later and I wasn’t really allowed to eat but they’d let me sneak in half a sandwich. They scanned me again and much to my surprise it turned out my feisty bossy daughter HAD pushed back in front and was presenting(!) and my cheeky funny son had gone breach- who would believe it!? Those personalities still ring true now. I didn’t even feel it happen. I told them it had been the other way round that morning and that both had been head down- they didn’t believe me. I felt they thought I was too out of it to remember but then the person who had scanned me that morning happened to come into the room to check me and confirmed what I had been saying – finally they didn’t think I was quite the crazy blonde I seemed! It was a long night of slow progress and contractions and lots of talking. I then had an epidural put in (probably like a lot of multiple mums) because of the recommendation that if natural labour did not work out and they needed to rush me in for a C section they said if the epidural was not already in place there wouldn’t be time to do it and I wouldn’t have to have a general anaesthetic. This I really wouldn’t want especially as it would mean missing the children being born! So I waited for the anaesthetist to put in the epidural – unfortunately only one side worked and the other side was still very painful especially in my groin. I thought I was stuck with that as when she finally came back she seemed to be saying sorry that’s the way it is but luckily the lovely midwife we were allocated pushed her for me and got her to check it again. It turned out that the needle, rather than falling out as is very common with epidurals, had actually gone further in. She said she’d never seen that in 10 years so it was quite unusual! Hooray- that felt so much better. Thursday morning, 29th January 2015 came and I remember them breaking my waters and clipping the heart monitor onto my daughters head. She certainly wasn’t budging back into second place now. I had got to 5 cm but then seemed to get stuck and they told me they would give me another couple of hours and then they might consider doing a C section if no progress so we tried for the next couple of hours but to no avail, I was still 5cm so the decision was made to do a C section. It’s not what I wanted but giving birth naturally was not to be. From there, it all then happened very quickly -I was prepped and taken to theatre and before I knew it they delivered Charlotte Rose weighing 6 lb 4 oz and Jonathan Gordon weighing 5 lb 13oz just 12 days early at 11:34 & 11:36am respectively. I felt so lucky! The sewing up took a crazy amount of time (40mins or so) and I was struggling to breathe, because my nose was blocked and I was lying so flat. They got concerned about my distress and pumped me full of yet more drugs. I lost quite a lot of blood and in the sewing up they were also concerned I had a bladder tear so had to check that as well but finally I was relieved to be able to sit up slightly and was wheeled out (vomiting again as I left!) with my two little babies and taken to ICU. A couple of hours later once Graham had struggled to get nappies on (men please practise this beforehand!) and I had rested a bit we were taken to a private room which would be our home for the next five days. I was so relieved when they said as I’d had a C section and twins that Graham could stay with me. Thank heavens as I really needed the help- he slept on a mattress on the floor for the whole 5 days without even a shower, helping me feed while we dealt with mild jaundice and some latching issues but nothing more. I was all geared up for them to maybe need special care and was amazed that they were both well and could stay with me. Finally once feeding was more on track we were let home on the Monday evening. Little did we know what craziness was in store for us over the coming nights, weeks and months but I wouldn’t have wanted to do it with anyone else but Graham and now at 22 months old they are an absolute delight and very precious to me. I can’t imagine life any other way. 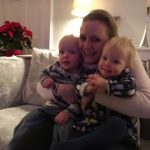 I am one very lucky twin mum and I’ll never forget it!